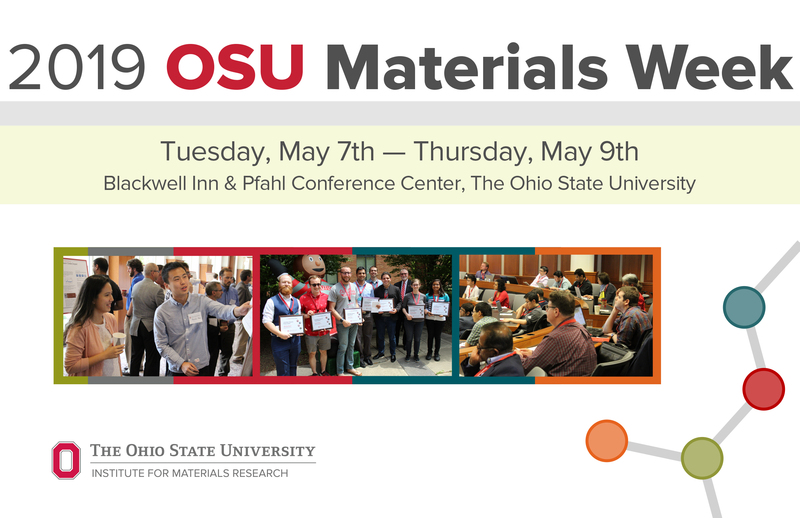 2019 OSU Materials Week – the 11th annual showcase of materials-allied research at The Ohio State University and beyond – will be held May 7-9, 2019 at the Blackwell Inn & Conference Center on Ohio State’s main campus. Our 11th annual conference features a keynote address, student poster sessions, and technical and cross cutting sessions focusing on the latest advances in the full spectrum of materials innovation. Ohio State master’s and doctoral students are invited to participate in the 2019 OSU Materials Week Three Minute Thesis (3MT®) competition, which challenges students to describe their research within three minutes to a general audience. Awards will be given to the winner, runner-up and people’s choice. Watch last year’s winning presentation here. Three Minute Thesis (3MT®) Finals: Graduate students are challenged to effectively communicate a distilled thesis and its significance in just three minutes. Poster Session: Undergraduate and graduate students at Ohio State share their work and receive feedback from professionals and students. Awards Ceremony: Join us on the Blackwell Patio for lunch and our awards presentation.